Glass doors, plastic strips or Eco-friendly Night Covers?. Retailers and supermarkets in Europe were given a choice - correct the food safety issue and energy consumption of open refrigerated cases immediately or close shop. They were given little warning and were told to comply and cover their cases. For some retailers this meant undertaking the costly alternative of installing glass doors. North America is taking a lesson from the Europeans and working to install eco-friendly and cost effective night covers like Econofrost woven aluminum night covers. 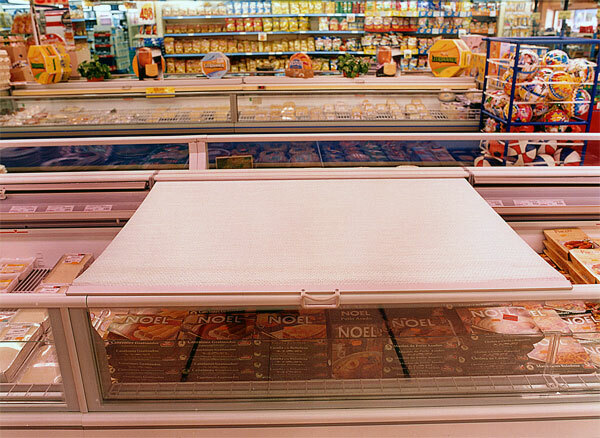 Stores that install Econofrost night covers end up saving thousands of dollars each year. And with a product lifetime durability of up to ten years, for retailers that can mean millions of dollars that they are saving and being able to reinvest back into the business. For every minute that the refrigerated display case be it a dairy line-up, multi-tier deck, or produce case remains open the refrigerated case is losing money. The forced cool air that is supposed to be circulating throughout the case is falling into the aisles and mixing with the warm ambient air. The refrigeration pump and refrigeration system components use significant energy to circulate the cool air within the case to help keep the merchandise cool. Health control officers and inspectors are getting tougher and cracking down on retailers who are not actively working to initiate food safety measures in their stores and departments. Store owners and managers hate the rising cost of energy and the pressure they face everyday on ensuring premium quality merchandise with a shelf life long enough to make the sale. Supermarkets are taking the bull by the horns and working with energy consultants and refrigeration contractors. Retrofitting woven aluminum night covers is just one of the many methods store owners are usint to conserve energy and reduce operating costs. Even the utility providers are pitching in to help drive the energy conscious initiative of installing night covers on all refrigerated and open cases. There are many open cases and stores that can benefit from installing Econofrost woven aluminum night covers on their application. 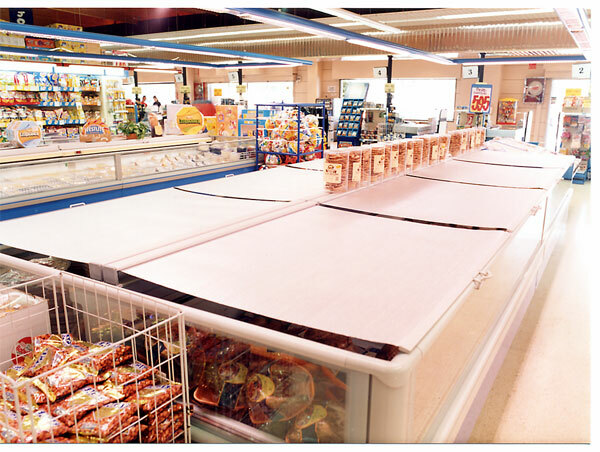 Dairy case line-ups, beverage cases, produce cases, self serve meat cases, wide island and coffin cases can accept Econofrost retrofit night covers to help maintain cooler product temperatures and lower operating costs. The integrity of the product is maximized and the customer experiences a more pleasurable shopping experience as they can comfortably walk the aisles of your store without having to be exposed to the cool air that spilled out from the open refrigerated cases.